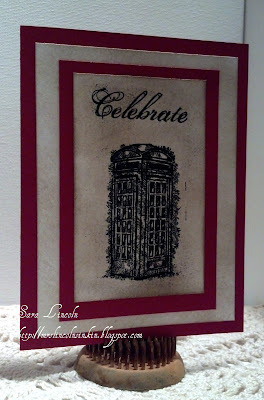 For today's card i used the new stamp set, Feeling Sentimental from the SAB Brochure which you can view Here. 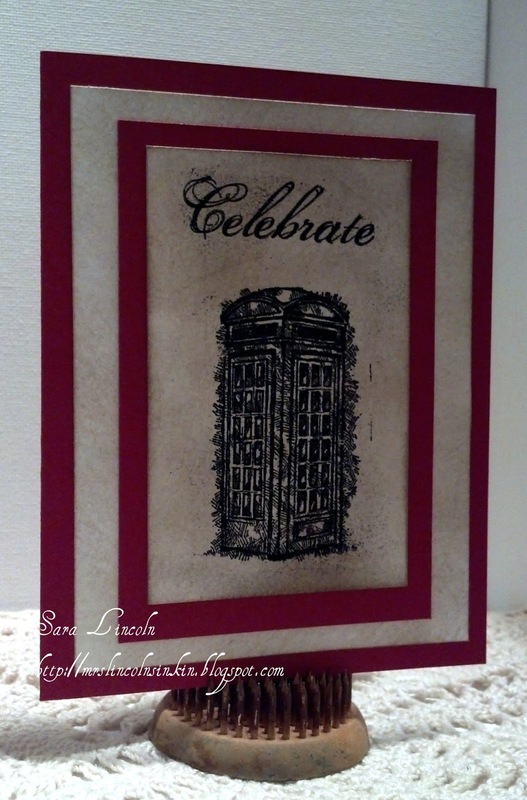 I wanted to do a simple card with layering (i loved the look of layering). So i used Cherry Cobbler as the base of my card then layered on top a piece of Whisper White cut at 5" x 3 3/4", another piece of Cherry Cobbler cut at 4 1/2" x 3", and then my final layer of Whisper White cut at 4" x 2 1/2". Once i got all my layers together, i realized that i didn't like how "white" the Whisper White was, so i took my sponge (we all know how much i love to sponge!!!) and sponged on some Sahara Sand. I didn't want to used a piece of Sahara Sand card stock, because i still wanted a tint of the White to show through. Plus i think think that it just gives it that "dusty" look that i think of when i think of the old phone booth. I then heat set my image with some Black Embossing Powder and that was that! Don't know what SAB through SU! is all about? No problem, here is the gist of it. For every $50 you spend right now (before s/h and tax) you receive a free item out of the SAB brochure. Yes, i said FREE!! So, you spend $50 you get one item... you spend $100 you get 2... and so on and so on. The amount of free items you get is endless! Don't miss out, click Here and place your order today!!! Also, introducing the Paper Pumpkin! A Paper Pumpkin membership is $19.95 per month (and shipping is included!) The commissionable amount is $14.95 for each Paper Pumpkin.